Eyelashes, like hair, shed as new lashes grow in, so don't be too be alarmed by the occasional stray lash on your bath towel or pillow case. But if old lashes fall out faster than new ones grow in, you have a problem. 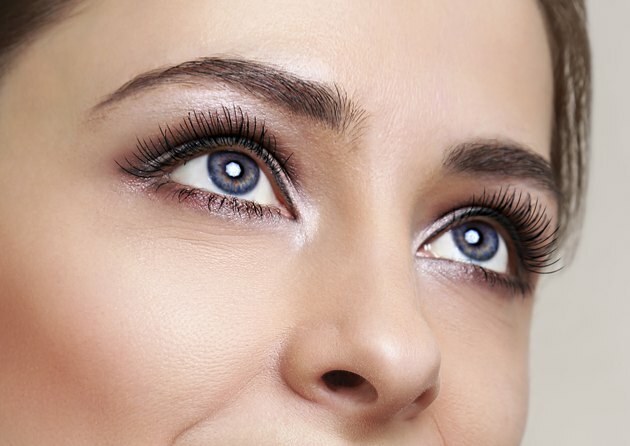 Identifying the cause of your eyelash loss can help you find a solution. When Silonie Sachdeva and Pawan Prasher of the Dermatology Department of Dayanand Medical College and University in India studied madarosis patients, they found that some lost their eyelashes due to the use of mascara, particularly waterproof mascara. In some cases, people had an allergic reaction to the mascara, which caused them to lose their lashes. In other cases, trying to remove the waterproof mascara resulted in removal of the eyelashes along with the mascara. Rubbing or tugging your eyelashes too hard can cause them to fall out. Pulling on lashes with an eyelash curler can also inflict trauma that can cause you to lose your lashes. Blepharitis refers to an inflammation of the eyelid. Your eyelid can become inflamed due to an infection, trauma or an allergic reaction. Some people lose their eyelashes during a bout with blepharitis. Treating the blepharitis relieves the symptoms and allows eyelashes to grow back. Alopecia areata is an autoimmune disorder that causes hair loss, including the loss of eyelashes in some people. If you suffer from other autoimmune disorders such as scleroderma or lupus, you may also lose eyelashes due to your disease. Endocrine disorders such as hypothyroidism can also cause hair loss, including loss of eyelashes. If you're undergoing chemotherapy treatment for cancer, you may lose your hair, including your eyelashes. Chemotherapy drugs target rapidly growing cells in the body, including hair follicles. Once the chemotherapy ceases, your eyelashes should grow back. Skin cancer that forms on the edge of the eyelids can cause eyelashes to fall out, according to the surgeons at Casey Eye Institute at Oregon Health and Science University.